The large attrition rate among new teachers led over thirty states in America to mandate the implementation of mentoring programs for beginning teachers. This method traditionally provides a new teacher with support from an experienced veteran as part of an induction process into a particular educational setting or into the field in general. It has been assumed that mentoring support for new teachers helps to successfully integrate them into their new roles and significantly reduces attrition. Yet, many academics and practitioners question whether current mentoring programs have sufficiently well articulated goals and, if so, whether the programs are appropriately constructed to maximally achieve those goals. A number of experts believe that, in general, mentoring in education has failed to realize its full potential, not only as a tool for induction, but also as a methodology for supervision of instruction. In recent years, researchers have begun to study the impact of mentoring and to formulate guidelines and practices designed to enhance the effectiveness of the mentoring process. Obstacles to Success Researchers have identified a number of factors that impede the development of successful mentoring programs in education: 1) Mentoring runs counter to the culture in most schools. Teachers tend to work autonomously in the privacy of their own classrooms. Most teachers have little experience with the activities that are central to mentoring – peer observation and cooperative reflective analysis. Teachers tend to resent intrusion into their domains, and hesitate to enter into the “private domains” of others. 2) School culture tends to discourage distinctions between teachers. The tendency to treat teachers as equals runs contrary to the concept of mentoring. 3) Ongoing changes in teaching philosophy and methodology bring into question whether mentor – protégé relationships actually serve to improve the effectiveness of beginning teachers. Some studies have shown that mentoring promotes conventional norms and practices, and therefore limits progressive change. 4) Limited scope and budgetary constraints tend to limit the support provided for mentoring programs. Release time needed for classroom observation and reflective discussion is not provided. Furthermore, mentors are often not given the training needed to gain an understanding of the role of the mentor and the skills required for effective implementation. As a result, mentoring efforts are often reduced to “big brother – big sister” style orientation programs. Orientation – The most basic level of mentoring provides an orientation for the beginning teacher to his/her new setting. On this level, the mentor helps to familiarize the protégé with school procedures, personnel, curriculum, expectations, and culture. Peer coaching – Here the mentor serves as a coach who provides feedback, support and guidance for the protégé in adopting effective teaching practices. Mentoring of the Mentoring Process – Here the school administrator or mentoring program coordinator coaches the mentors (and perhaps the protégé) to reflect on their mentoring work, their professional growth in both mentoring and teaching, and the application of their own learning in their classrooms. Mutual Coaching on Mentoring – On this level, the mentor and protégé step back to examine what they are learning about effective mentoring and coaching, and how they might improve their work together. They create an individualized program geared specifically to the needs of the protégé, an aspect that is desirable in classroom instruction as well. The impact of the coaching is increased because of the reflection and analysis, which allow the protégé to integrate new skills with existing knowledge. The mentor becomes a learner in the process and the mentoring therefore impacts positively on the instruction of both the mentor and the protégé. The skills of reflective thinking can be transferred to the classroom with the goal of developing higher thinking skills in the students. When implemented on a larger scale, the process impacts on the entire staff by creating a culture of reflective practice. Release Time –to observe each other’s classes and those of other successful teachers, and to hold reflective discussions. Similarly, mentors and protégé’s should be excused from some extra-curricular duties. New Teacher Class Assignment –that minimize preparations and do not include particularly difficult groups of students. Mentor Training – that clarifies the role of the mentor and teaches the skills that are essential for effective mentoring. Administrative Leadership – ongoing support and involvement of the educational leader is an important element in the success of higher-level programs. A. Assessment vs. Mentoring – Ideally, mentoring should be conducted exclusive of assessment. Mentors who are not involved in assessment must maintain confidentiality in order to earn the trust of the protégé. It is important for administrators to respect that confidentiality. Administrators who are involved directly in mentoring must walk the fine line between coaching and evaluation. The creation of a reflective learning environment reduces the tension between mentoring and assessment. B. Mentor – Protégé Matching– An important element in the success of the mentoring process is the relationship between the mentor and the protégé. Some experts believe that the success of mentoring depends largely on the match between the mentor and the protégé and they place great emphasis on that aspect. Others feel it is more important to focus on the creation of optimal conditions for mentoring rather than on the relationship, which is highly unpredictable. Mentoring has not been well developed within the Jewish day schools. This is an issue that deserves attention in general. Mentoring has specific application, as well, in the employment of shlichim from Israel. In recent years, the use of shlichim has diminished in American day schools, largely as a result of difficult situations in which teachers failed to integrate well into the school. 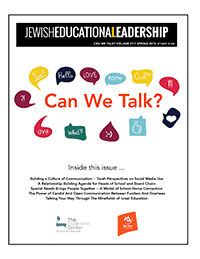 However, the current personnel crisis in Jewish day schools has produced a renewed interest in shlichut. The integration of shlichim is particularly difficult because, although they have teaching experience, they are entering a culture that is much different from the educational culture from which they come. In order to maximize the success of shlichut and to take advantage of the pool of teachers that are available in Israel, Jewish day schools should consider the development of mentoring programs designed specifically for shlichim.